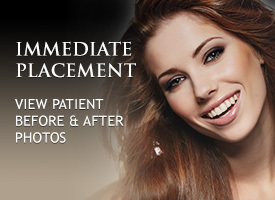 Dental implants are a permanent and reliable solution to missing teeth. 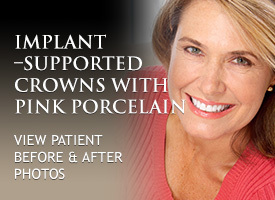 Implants can replace a single tooth or hold a bridge, partial dentures, or full dentures. Dental Implants use a titanium rod that fuses to the jawbone to create the tooth’s root. This rod will support the dental crown. Dental Implants look and function like natural teeth, revitalizing your beautiful smile as well as restoring your ability to speak and chew properly. Your dentist will determine the number of dental implants needed to provide adequate, long-lasting support. The amount and quality of existing bone, the bite, and anatomical factors all affect the number and type of implants necessary for restoration. The procedural process involves two phases. The titanium implant is placed into the jawbone. It heals for three to six months, during which osseointegration (bone fusing to the implant) takes place. In most cases, patients will wear an interim restoration to camouflage their teeth. Once the implant is thoroughly fused with the jawbone, an artificial crown will be securely attached. 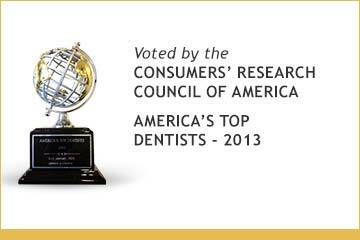 The overall success of the procedure depends on the patient’s mouth anatomy and the quality of the crown attached. In many cases, dental implants can be placed immediately into fresh extraction sockets. Same-day implantation limits overall treatment time and offers some aesthetic and functional advantages. 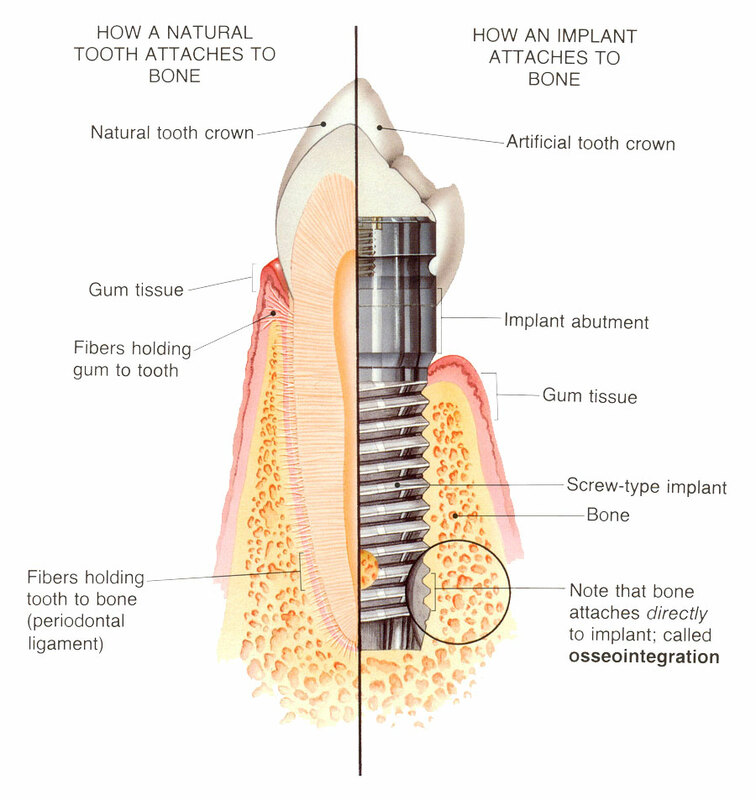 It is beneficial to receive your dental implant as soon as possible to prevent bone loss. However, there are cases where implants have been successfully placed for patients that did not meet the criteria of good oral health and adequate bone mass. 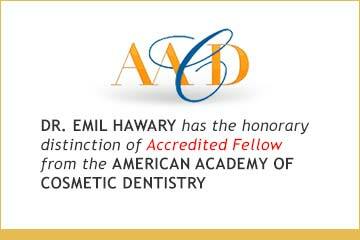 Dr. Hawary will determine whether you are a good candidate during your in-office consultation. Why is it important to preserve the bone density in my jaw? The jawbone, along with the teeth, help support the skin that covers the lower half of the face. When your bone density decreases, it can no longer adequately support the surrounding tissue. The lips and skin then sink in towards the mouth, aging the face. How will my dental implant preserve my jawbone density? Since the titanium rod acts as the tooth’s root, chewing vibrations are transferred from the crown to the rod and into the bone. These vibrations stimulate bone growth. Most research supports that 25 percent of bone loss occurs in the first year after tooth loss. For this reason, it is suggested that implants are inserted as soon as possible after tooth extraction. How many teeth can I replace using dental implants? You can potentially replace all of your teeth using dental implants. 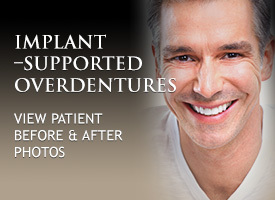 Strategically placed implants can be used to support full dentures. 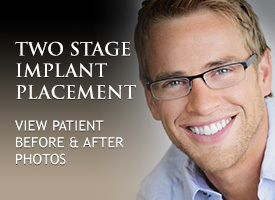 Can I have my crown attached while my implant heals instead of after? A newly inserted dental implant is fairly weak, and it takes several months to fuse with the bone. 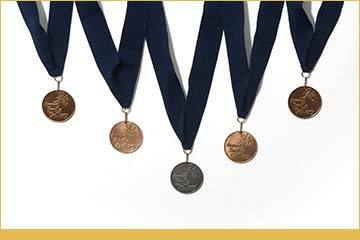 Placing the crown on too early can cause structural weakness and pain.